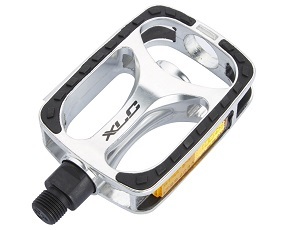 XLC stands for ‘X-cellent Components’ and manufactures high-tech bicycle parts and accessories. XLC’s products benefit from 100 years of bicycle experience and each has to pass a series of tough tests before it comes onto the market. This means cyclists can rest assured that the company’s components are extremely reliable. Products are available in a wide range of colours, meaning they look as great as they perform. XLC is a relatively young company that manufactures bicycle parts and accessories. On the Bikester.co.uk website, you will find everything from simple products that are ideal for everyday use, to high-level parts to suit the ambitious cyclist. Its wide range includes everything from pedals, steering wheels, tools to bike lights, bicycle shoes and bicycle pumps. XLC, part of the Accell group, strives to place functionality, style, comfort and technology at the forefront of every bike part and accessory it produces. With over 100 years in the industry, XLC brings its experience and knowledge of the bike industry to each and every component it makes. Not only that, each part undergoes stringent tests in its headquarters before being released on the market, leaving nothing to chance. XLC has almost everything that you as a cyclist and your bike may need to get the most out of your ride and is proud to have built its reputation on creating technologically advanced products that are very high quality and of superior design. The Accell Group is also environmentally conscious, researching the many different ways they can reduce energy consumption during both the manufacturing and production of the components, the transportation of the goods and the recycling of used materials, among others. XLC manufactures high-performance and extremely reliable bicycle parts and accessories. Not only that, the products are available in a myriad of different colours and styles so that they look as great as they perform. On the Bikester.co.uk website, choose from a comprehensive selection of components and accessories including pedals, steering wheels, tools, bike lights, pumps and even shoes. Whatever you may be searching for, rest assured that XLC will provide you with exactly what you need for your best ride ever.